I made these Ferrero Raffaello Coconut Candy Balls for my friend Shea because she is one special lady. Today Shea has invited me to do a guest post on her blog, Dixie Chik Cooks! 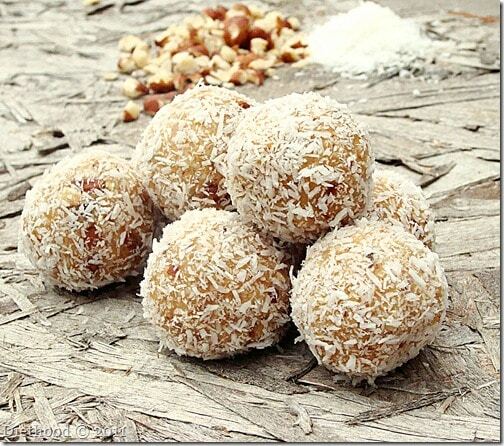 Homemade version of Ferrero Raffaello's famous Coconut Candy Balls. In a large mixing bowl thoroughly combine the graham cracker crumbs, coconut flakes, hazelnuts and powdered sugar. Stir the milk and melted butter into the dry mixture, and mix until everything is well combined. Shape small bits of the dough into balls and roll them in the coconut flakes. Put the cookie balls in the refrigerator for at least 2 hours before serving. You can also store these for a few days in the refrigerator in tightly covered containers. Total time includes refrigeration time. O my gosh!! This looks incredible! And I can even make it Glutenfree for a friend! This is amazing candy… Love it. I am hopping right over now. I love these little balls and I want the recipe. I had the first time last year – marvelous! Can’t wait to try these….thanks for posting. These looks so good! Thanks for sharing! Holy wow! those look amazing!! What a lovely thing to do for your friend!! And these look absolutely gorgeous! Excellent job!! Kate – another brilliant recipe. Love the photo, too! Heading over to Shea’s site now! Hi Kate! Ohhhh I love coconut and you made such a perfect treat for me… LOL. I’m going to her site now! I still get excited when I get comments….each & every one. I will go check out your guest post. These look great! Those ferrero candies are crazy addictive, I’m sure these are great (and much simpler to make than a ‘dupe’ recipe). YUM! I love me some coconut, and these look very good! Yum! Your friend is one lucky girl! 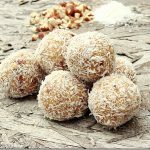 Those Ferrero coconut balls are one of my husband’s favorites. I’m going to go check out the recipe. Those coconut balls look divine! I will have to make them too. I have just come back from a visit to Shea’s blog. These do look amazing. I’m on my way – they sound irresistible. congrats on the guest post, and raffaello looks amazing Kate!!! Wow these look amazing! I love all the Ferrero candies. These look beautiful! ooooo can’t wait to read your guest post!!! they look mouthwateringly wonderful!! I love ferrero raffaello, and i think that’s fantastic to be able to make them at home! thx so much! On my way over there. Gorgeous picture! Um, wow! I love the commercial version but yours is an identical look-alike. Off to check out the recipe! Oooh! Gorgeous picture 🙂 Heading over there now to see what you’ve got in store! Irena, it’s my mom’s recipe and I recall how crazy everyone in Macedonia was for the recipe… my mom had to write it down for soooo many people.